Staying stylish on a college budget can be hard, which is why DIY Chic is here to show you how to update your wardrobe without breaking the bank. If you are looking for more DIY inspiration, take a look at our past tutorials on making a multi-strand statement necklace, bow hair accessories, flower hair clips, a printed word scarf, transforming a pair of old jeans, or recreating an old or thrifted item. Here at College Fashion, the cap-toe ballet flat has already been deemed a favorite spring shoe trend. But if you aren’t ready to invest in a pair just yet, this easy DIY could be a great alternative. 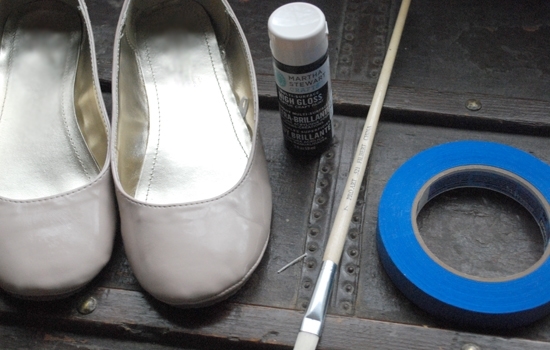 Take a look at this week’s tutorial on transforming a pair of plain flats with a trendy cap-toe look. A pair of plain flats. I opted for my old beige flats, but this idea could apply to just about any pair. Paint. I used a high-gloss, all-purpose paint with an acrylic base in black. Blue Painter’s tape, which allows for easy removal. 1. 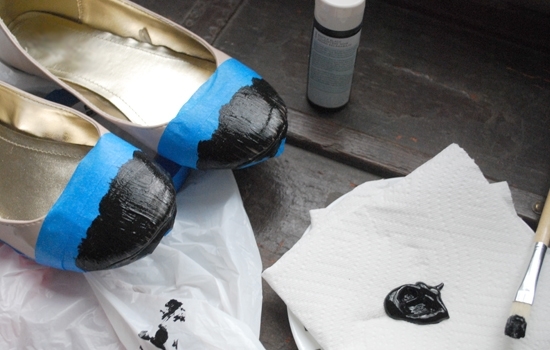 Carefully tape off the toes of your flats where you’ll be painting. You might also want to tape around the bottom edge to avoid getting any paint on the sole of the shoes. Be sure to match the taped areas carefully on both shoes. 2. Start your painting process. Depending on the material of your shoes and type of paint, it might take multiple coats of paint to get the right look – it took me two coats before I was satisfied. Allow each coat of paint to dry fully before you apply another, preferably overnight. 3. 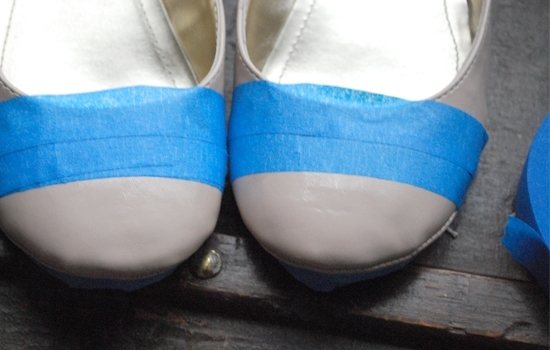 When your flats are dry, carefully remove the blue painter’s tape. If needed, you can fix any uneven lines by touching up the paint job with a smaller paint brush by hand. And there you go! A quick and easy way to recreate an old pair of flats and try out the cap-toe trend on the cheap. As I said, this idea could be applied to just about any pair of shoes you own, from flats to heels, just in time for spring! Try it with black paint like I did or test out the neon trend – it’s totally up to you. What do you think of the cap-toe ballet flat trend? Would you try this simple DIY at home? Do you have an do-it-yourself project you’d like to see on College Fashion in the future? Let us know in a comment!